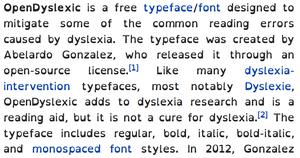 An example of OpenDyslexic typeface, used to try to help with common reading errors in dyslexia. Dyslexia is believed to be caused by both genetic and environmental factors. Some cases run in families. It often occurs in people with attention deficit hyperactivity disorder (ADHD) and is associated with similar difficulties with numbers. It may begin in adulthood as the result of a traumatic brain injury, stroke, or dementia. The underlying mechanisms of dyslexia are problems within the brain's language processing. Dyslexia is diagnosed through a series of tests of memory, spelling, vision, and reading skills. Dyslexia is separate from reading difficulties caused by hearing or vision problems or by insufficient teaching. Treatment involves adjusting teaching methods to meet the person's needs. While not curing the underlying problem, it may decrease the degree of symptoms. Treatments targeting vision are not effective. Dyslexia is the most common learning disability and occurs in all areas of the world. It affects 3–7% of the population, however, up to 20% may have some degree of symptoms. While dyslexia is more often diagnosed in men, it has been suggested that it affects men and women equally. Some believe that dyslexia should be best considered as a different way of learning, with both benefits and downsides. Dyslexia is thought to have two types of cause, one related to language processing and another to visual processing. It is considered a cognitive disorder, not a problem with intelligence. However, emotional problems often arise because of it. Some published definitions are purely descriptive, whereas others propose causes. The latter usually cover a variety of reading skills and deficits, and difficulties with distinct causes rather than a single condition. The National Institute of Neurological Disorders and Stroke definition describes dyslexia as "difficulty with phonological processing (the manipulation of sounds), spelling, and/or rapid visual-verbal responding". The British Dyslexia Association definition describes dyslexia as "a learning difficulty that primarily affects the skills involved in accurate and fluent word reading and spelling" and is characterized by "difficulties in phonological awareness, verbal memory and verbal processing speed". There is some variability in the definition of dyslexia. Some sources, such as the U.S. National Institutes of Health, define it specifically as a learning disorder. Other sources, however, define it simply as an inability to read in the context of normal intelligence, and distinguish between developmental dyslexia (a learning disorder) and acquired dyslexia (loss of the ability to read caused by brain damage). ICD 10, the manual of medical diagnosis used in much of the world, includes separate diagnoses for "developmental dyslexia" (81.0) and for "dyslexia and alexia" (48.0). DSM 5, the manual of psychiatric diagnosis used in the United States, does not specifically define dyslexia, justifying this decision by stating that "the many definitions of dyslexia and dyscalculia meant those terms would not be useful as disorder names or in the diagnostic criteria". Instead it includes dyslexia in a category called specific learning disorders. In early childhood, symptoms that correlate with a later diagnosis of dyslexia include delayed onset of speech and a lack of phonological awareness, as well as being easily distracted by background noise. A common myth closely associates dyslexia with mirror writing and reading letters or words backwards. These behaviors are seen in many children as they learn to read and write, and are not considered to be defining characteristics of dyslexia. School-age children with dyslexia may exhibit signs of difficulty in identifying or generating rhyming words, or counting the number of syllables in words – both of which depend on phonological awareness. They may also show difficulty in segmenting words into individual sounds or may blend sounds when producing words, indicating reduced phonemic awareness. Difficulties with word retrieval or naming things is also associated with dyslexia. :647 People with dyslexia are commonly poor spellers, a feature sometimes called dysorthographia or dysgraphia, which depends on orthographic coding. Problems persist into adolescence and adulthood and may accompany difficulties with summarizing stories, memorization, reading aloud, or learning foreign languages. Adults with dyslexia can often read with good comprehension, though they tend to read more slowly than others without a learning difficulty and perform worse in spelling tests or when reading nonsense words – a measure of phonological awareness. The orthographic complexity of a language directly impacts how difficult learning to read the language is. :266 English and French have comparatively "deep" phonemic orthographies within the Latin alphabet writing system, with complex structures employing spelling patterns on several levels: letter-sound correspondence, syllables, and morphemes. :421 Languages such as Spanish, Italian and Finnish have mostly alphabetic orthographies, which primarily employ letter-sound correspondence – so-called shallow orthographies – which for dyslexics makes them easier to learn. :266 Logographic writing systems, such as Chinese characters, have extensive symbol use, and pose problems for dyslexic learners. Dysgraphia – A disorder which primarily expresses itself through difficulties with writing or typing, but in some cases through difficulties associated with eye–hand coordination and direction or sequence-oriented processes such as tying knots or carrying out repetitive tasks. In dyslexia, dysgraphia is often multifactorial, due to impaired letter-writing automaticity, organizational and elaborative difficulties, and impaired visual word forming which makes it more difficult to retrieve the visual picture of words required for spelling. Attention deficit hyperactivity disorder (ADHD) – A disorder characterized by problems paying attention, excessive activity, or taking action without forethought. Dyslexia and ADHD commonly occur together. Either 15% or 12–24% of people with dyslexia have ADHD. 35% of people with ADHD have dyslexia. Auditory processing disorder – A listening disability that affects the ability to process auditory information. This can lead to problems with auditory memory and auditory sequencing. Many people with dyslexia have auditory processing problems, and may develop their own logographic cues to compensate for this type of deficit. Some research indicates that auditory processing skills could be the primary shortfall in dyslexia. Developmental coordination disorder – A neurological condition characterized by marked difficulty in carrying out routine tasks involving balance, fine-motor control, kinesthetic coordination, difficulty in the use of speech sounds, problems with short-term memory, and organization. Inferior parietal lobule (superior view). Some dyslexics demonstrate less electrical activation in this area. Researchers have been trying to find the neurobiological basis of dyslexia since the condition was first identified in 1881. For example, some have tried to associate the common problem among dyslexics of not being able to see letters clearly to abnormal development of their visual nerve cells. Modern neuroimaging techniques such as functional magnetic resonance imaging (fMRI) and positron emission tomography (PET) have shown a correlation between both functional and structural differences in the brains of children with reading difficulties. Some dyslexics show less electrical activation in parts of the left hemisphere of the brain involved with reading, such as the inferior frontal gyrus, inferior parietal lobule, and the middle and ventral temporal cortex. Over the past decade, brain activation studies using PET to study language have produced a breakthrough in the understanding of the neural basis of language. Neural bases for the visual lexicon and for auditory verbal short-term memory components have been proposed, with some implication that the observed neural manifestation of developmental dyslexia is task-specific (i.e. functional rather than structural). fMRIs in dyslexics have provided important data which point to the interactive role of the cerebellum and cerebral cortex as well as other brain structures. The cerebellar theory of dyslexia proposes that impairment of cerebellum-controlled muscle movement affects the formation of words by the tongue and facial muscles, resulting in the fluency problems that are characteristic of some dyslexics. The cerebellum is also involved in the automatization of some tasks, such as reading. The fact that some dyslexic children have motor task and balance impairments has been used as evidence for a cerebellar role in their reading difficulties. However, the cerebellar theory is not supported by controlled research studies. Research into potential genetic causes of dyslexia has its roots in post-autopsy examination of the brains of people with dyslexia. Observed anatomical differences in the language centers of such brains include microscopic cortical malformations known as ectopias, more rarely, vascular micro-malformations, and microgyrus. The previously cited studies and others suggest that abnormal cortical development presumed to occur before or during the sixth month of fetal brain development was the cause of the abnormalities. Abnormal cell formations in dyslexics have also been reported in non-language cerebral and subcortical brain structures. Several genes have been associated with dyslexia, including DCDC2 and KIAA0319 on chromosome 6, and DYX1C1 on chromosome 15. The contribution of gene–environment interaction to reading disability has been intensely studied using twin studies, which estimate the proportion of variance associated with a person's environment and the proportion associated with their genes. Studies examining the influence of environmental factors such as parental education and teacher quality have determined that genetics have greater influence in supportive, rather than less optimal, environments. However, more optimal conditions may just allow those genetic risk factors to account for more of the variance in outcome because the environmental risk factors have been minimized. As environment plays a large role in learning and memory, it is likely that epigenetic modifications play an important role in reading ability. Animal experiments and measures of gene expression and methylation in the human periphery are used to study epigenetic processes; however, both types of study have many limitations in the extrapolation of results for application to the human brain. The dual-route theory of reading aloud was first described in the early 1970s. This theory suggests that two separate mental mechanisms, or cognitive routes, are involved in reading aloud. One mechanism is the lexical route, which is the process whereby skilled readers can recognize known words by sight alone, through a "dictionary" lookup procedure. The other mechanism is the nonlexical or sublexical route, which is the process whereby the reader can "sound out" a written word. This is done by identifying the word's constituent parts (letters, phonemes, graphemes) and applying knowledge of how these parts are associated with each other, for example, how a string of neighboring letters sound together. The dual-route system could explain the different rates of dyslexia occurrence between different languages (e.g. the Spanish language dependence on phonological rules accounts for the fact that Spanish-speaking children show a higher level of performance in non-word reading, when compared to English-speakers). Dyslexia disorder is not caused by mutation in one gene; in fact, it appears to involve the combined effects of several genes. Studying the cognitive problems associated with other disorders helps to better understand the genotype-phenotype link of dyslexia. Neurophysiological and imaging procedures are being used to ascertain phenotypic characteristics in dyslexics, thus identifying the effects of certain genes. There are tests that can indicate with high probability whether a person is a dyslexic. If diagnostic testing indicates that a person may be dyslexic, such tests are often followed up with a full diagnostic assessment to determine the extent and nature of the disorder. Tests can be administered by a teacher or computer. Some test results indicate how to carry out teaching strategies. Central dyslexias include surface dyslexia, semantic dyslexia, phonological dyslexia, and deep dyslexia. ICD-10 reclassified the previous distinction between dyslexia (315.02 in ICD-9) and alexia (315.01 in ICD-9) into a single classification as R48.0. The terms are applied to developmental dyslexia and inherited dyslexia along with developmental aphasia and inherited alexia, which are considered synonymous. In surface dyslexia, words with regular pronunciations (highly consistent with their spelling, e.g. mint) are read more accurately than words with irregular pronunciation, such as colonel. Difficulty distinguishing homophones is a diagnostic used for some forms of surface dyslexia. This disorder is usually accompanied by surface agraphia and fluent aphasia. Acquired surface dyslexia arises when a previously literate person experiences brain damage, which results in pronunciation errors that indicate impairment of the lexical route. In phonological dyslexia, sufferers can read familiar words but have difficulty with unfamiliar words, such as invented pseudo-words. Phonological dyslexia is associated with lesions in the parts of the brain supplied with blood by the middle cerebral artery. The superior temporal lobe is often also involved. Furthermore, dyslexics compensate by overusing a front-brain region called Broca's area, which is associated with aspects of language and speech. The Lindamood Phoneme Sequencing Program (LiPS) is used to treat phonological dyslexia. This system is based on a three-way sensory feedback process, using auditory, visual, and oral skills to learn to recognize words and word patterns. Case studies with a total of three patients found a significant improvement in spelling and reading ability after using LiPS. Individuals with deep dyslexia experience both semantic paralexia (para-dyslexia) and phonological dyslexia, causing the person to read a word and then say a related meaning instead of the denoted meaning. Deep dyslexia is associated with clear phonological processing impairments. Deep dyslexia is caused by widespread damage to the brain that often includes the left hemisphere. The "continuum" hypothesis claims that deep dyslexia develops from phonological dyslexia. Peripheral dyslexias have been described as affecting the visual analysis of letters as a result of brain injury. Hemianopsia, a visual field loss on the left/right side of the vertical midline, is associated with this condition. Pure, or phonologically-based, dyslexia, also known as agnosic dyslexia, dyslexia without agraphia, and pure word blindness, is dyslexia due to difficulty in recognizing written sequences of letters (such as words), or sometimes even letters. It is considered '"pure" because it is not accompanied by other significant language-related impairments. Pure dyslexia does not affect speech, handwriting style, language or comprehension impairments. Pure dyslexia is caused by lesions on the visual word form area (VWFA). The VWFA is composed of the left lateral occipital sulcus and is activated during reading. A lesion in the VWFA stops transmission between the visual cortex and the left angular gyrus. It can also be caused by a lesion involving the left occipital lobe or the splenium. It is usually accompanied by a homonymous hemianopsia in the right side of the visual field. Multiple oral re-reading (MOR) is a treatment for pure dyslexia. It is considered a top-down processing technique in which affected individuals read and reread texts a predetermined number of times or until reading speed or accuracy improves a predetermined amount. Hemianopic dyslexia is commonly considered to derive from visual field loss due to damage to the primary visual cortex. Sufferers may complain of abnormally slow reading but are able to read individual words normally. This is the most common form of peripheral alexia, and the form with the best evidence of effective treatments. In neglect dyslexia, some letters, most commonly those at the beginning or left side of a word, are skipped or misread during reading. This alexia is associated with right parietal lesions. The use of prism glasses has been shown to mitigate this condition substantially. People with attentional dyslexia complain of letter-crowding or migration, sometimes blending elements of two words into one. Sufferers read better when words are presented in isolation rather than flanked by other words and letters. Using a large magnifying glass may help mitigate this condition by reducing the effects of flanking from nearby words; however, no trials of this or indeed any other therapy for left parietal syndromes have been published as of 2014. Through the use of compensation strategies, therapy and educational support, dyslexic individuals can learn to read and write. There are techniques and technical aids which help to manage or conceal symptoms of the disorder. Removing stress and anxiety alone can sometimes improve written comprehension. For dyslexia intervention with alphabet-writing systems, the fundamental aim is to increase a child's awareness of correspondences between graphemes (letters) and phonemes (sounds), and to relate these to reading and spelling by teaching how sounds blend into words. It has been found that reinforced collateral training focused on reading and spelling yields longer-lasting gains than oral phonological training alone. Early intervention that is done for children at a young age can be successful in reducing reading failure. There is some evidence that the use of specially-tailored fonts may help with dyslexia. These fonts, which include Dyslexie, OpenDyslexic, and Lexie Readable, were created based on the idea that many of the letters of the Latin alphabet are visually similar and may, therefore, confuse people with dyslexia. Dyslexie and OpenDyslexic both put emphasis on making each letter more distinctive in order to be more easily identified. The benefits, however, might simply be due to the added spacing between words. There have been many studies conducted regarding intervention in dyslexia. Among these studies one meta-analysis found that there was functional activation as a result. There is no evidence demonstrating that the use of music education is effective in improving dyslexic adolescents' reading skills. Dyslexic children require special instruction for word analysis and spelling from an early age. While there are fonts that may help people with dyslexia better understand writing, this might simply be due to the added spacing between words. The prognosis, generally speaking, is positive for individuals who are identified in childhood and receive support from friends and family. The percentage of people with dyslexia is unknown, but it has been estimated to be as low as 5% and as high as 17% of the population. While it is diagnosed more often in males, some believe that it affects males and females equally. There are different definitions of dyslexia used throughout the world, but despite significant differences in writing systems, dyslexia occurs in different populations. Dyslexia is not limited to difficulty in converting letters to sounds, and Chinese dyslexics may have difficulty converting Chinese characters into their meanings. The Chinese vocabulary uses logographic, monographic, non-alphabet writing where one character can represent an individual phoneme. The phonological-processing hypothesis attempts to explain why dyslexia occurs in a wide variety of languages. Furthermore, the relationship between phonological capacity and reading appears to be influenced by orthography. Dyslexia was identified by Oswald Berkhan in 1881, but the term dyslexia was coined in 1887 by Rudolf Berlin, an ophthalmologist in Stuttgart. He used the term to refer to the case of a young boy who had a severe impairment in learning to read and write, despite showing typical intelligence and physical abilities in all other respects. In 1896, W. Pringle Morgan, a British physician from Seaford, East Sussex, published a description of a reading-specific learning disorder in a report to the British Medical Journal titled "Congenital Word Blindness". The distinction between phonological and surface types of dyslexia is only descriptive, and without any etiological assumption as to the underlying brain mechanisms. However, studies have alluded to potential differences due to variation in performance. The majority of currently available dyslexia research relates to alphabetic writing systems, and especially to European languages. However, substantial research is also available regarding dyslexics who speak Arabic, Chinese, Hebrew, or other languages. As is the case with any disorder, society often makes an assessment based on incomplete information. Before the 1980s, dyslexia was thought to be a consequence of education, rather than a basic disability. As a result, society often misjudges those with the disorder. There is also sometimes a workplace stigma and negative attitude towards those with dyslexia. If a dyslexic's instructors lack the necessary training to support a child with the condition, there is often a negative effect on the student's learning participation. ^ a b c de Leeuw R (December 2010). "Special Font For Dyslexia?" (PDF) (in English and Dutch). University of Twente: 32. Archived from the original (PDF) on 1 November 2011. Retrieved 1 November 2011. ^ a b c d e f g h "Dyslexia Information Page". National Institute of Neurological Disorders and Stroke. 2 November 2018. ^ a b c d e f g h i j k l Peterson RL, Pennington BF (May 2012). "Developmental dyslexia". Lancet. 379 (9830): 1997–2007. doi:10.1016/s0140-6736(12)60198-6. PMC 3465717. PMID 22513218. ^ a b c d e f g "What are reading disorders?". National Institutes of Health. 1 December 2016. ^ a b "How are reading disorders diagnosed?". National Institutes of Health. Archived from the original on 2 April 2015. Retrieved 15 March 2015. ^ a b c Kooij JJ (2013). Adult ADHD diagnostic assessment and treatment (3rd ed.). London: Springer. p. 83. ISBN 9781447141389. Archived from the original on 30 April 2016. ^ Siegel LS (November 2006). "Perspectives on dyslexia". Paediatrics & Child Health. 11 (9): 581–7. doi:10.1093/pch/11.9.581. PMC 2528651. PMID 19030329. ^ "What are the symptoms of reading disorders?". National Institutes of Health. 1 December 2016. ^ "What are common treatments for reading disorders?". National Institutes of Health. Archived from the original on 2 April 2015. Retrieved 15 March 2015. ^ a b c d e f Handler SM, Fierson WM (March 2011). "Learning disabilities, dyslexia, and vision". Pediatrics. 127 (3): e818–56. doi:10.1542/peds.2010-3670. PMID 21357342. ^ a b Umphred DA, Lazaro RT, Roller M, Burton G (2013). Neurological Rehabilitation. Elsevier Health Sciences. p. 383. ISBN 978-0-323-26649-9. Archived from the original on 9 January 2017. ^ "How many people are affected by/at risk for reading disorders?". National Institutes of Health. Archived from the original on 2 April 2015. Retrieved 15 March 2015. ^ Venton, Danielle (September 2011). "The Unappreciated Benefits of Dyslexia". Wired. Archived from the original on 5 August 2016. Retrieved 10 August 2016. ^ Mathew, Schneps (August 2014). "The Advantages of Dyslexia". ScientificAmerican.com. Scientific American. Archived from the original on 4 August 2016. Retrieved 10 August 2016. ^ a b Campbell RJ (2009). Campbell's Psychiatric Dictionary. Oxford University Press. pp. 310–312. ISBN 978-0-19-534159-1. Archived from the original on 9 January 2017. ^ Lyytinen H, Erskine J, Kujala J, Ojanen E, Richardson U (December 2009). "In search of a science-based application: a learning tool for reading acquisition". Scandinavian Journal of Psychology. 50 (6): 668–75. doi:10.1111/j.1467-9450.2009.00791.x. PMID 19930268. ^ Phillips S, Kelly K, Symes L (2013). Assessment of Learners with Dyslexic-Type Difficulties. SAGE. p. 7. ISBN 978-1-4462-8704-0. Archived from the original on 9 January 2017. ^ a b c d Woollams AM (2013). "Connectionist neuropsychology: uncovering ultimate causes of acquired dyslexia". Philosophical Transactions of the Royal Society of London. Series B, Biological Sciences. 369 (1634): 20120398. doi:10.1098/rstb.2012.0398. PMC 3866427. PMID 24324241. ^ Heilman KM, Valenstein E (2011). Clinical Neuropsychology. Oxford University Press. pp. 115–116. ISBN 978-0-19-538487-1. ^ Spivey M, Joanisse M, McRae K (2012). The Cambridge Handbook of Psycholinguistics. Cambridge University Press. pp. 219–220. ISBN 978-0-521-67792-9. Archived from the original on 9 January 2017. ^ "ICD-10 Version:2015". apps.who.int. Archived from the original on 2 November 2015. Retrieved 4 November 2015. ^ "Specific learning disorders" (PDF). American Psychiatric Publishing. 2013. Archived (PDF) from the original on 23 September 2015. Retrieved 6 November 2015. ^ Lilienfeld SO, Lynn SJ, Ruscio J, Beyerstein BL (15 September 2011). 50 Great Myths of Popular Psychology: Shattering Widespread Misconceptions about Human Behavior. John Wiley & Sons. pp. 88–89. ISBN 978-1-4443-6074-5. Archived from the original on 9 January 2017. Retrieved 19 May 2016. ^ "Dyslexia and Related Disorders" (PDF). Alabama Dyslexia Association. International Dyslexia Association. January 2003. Archived (PDF) from the original on 4 March 2016. Retrieved 29 April 2015. ^ Peer L, Reid G (2014). Multilingualism, Literacy and Dyslexia. Routledge. p. 219. ISBN 978-1-136-60899-5. Archived from the original on 9 January 2017. ^ Shaywitz SE, Shaywitz BA (2013). "Chapter 34 Making a Hidden Disability Visible: What Has Been Learned from Neurobiological Studies of Dyslexia". In Swanson HL, Harris KR, Graham S. Handbook of Learning Disabilities (2 ed.). Guilford Press. ISBN 978-1-4625-0856-3. Archived from the original on 9 January 2017. ^ Lum JA, Ullman MT, Conti-Ramsden G (October 2013). "Procedural learning is impaired in dyslexia: evidence from a meta-analysis of serial reaction time studies". Research in Developmental Disabilities. 34 (10): 3460–76. doi:10.1016/j.ridd.2013.07.017. PMC 3784964. PMID 23920029. ^ a b c Paulesu E, Brunswick N, Paganelli F (2010). "Chapter 12: Cross-cultural differences in unimpaired and dyslexic reading: Behavioral and functional anatomical observations in readers of regular and irregular orthographies.". In Brunswick N, McDougall S, de Mornay Davies P. Reading and Dyslexia in Different Orthographies. Psychology Press. ISBN 9781135167813. ^ Juelm C (2013). "The Impact of Early School Experiences on Initial Reading". In David K. Dickinson, Susan B. Neuman. Handbook of Early Literacy Research. Guilford Publications. ISBN 978-1-4625-1470-0. ^ Snowling MJ, Hulme C (May 2012). "Annual research review: the nature and classification of reading disorders--a commentary on proposals for DSM-5". Journal of Child Psychology and Psychiatry, and Allied Disciplines. 53 (5): 593–607. doi:10.1111/j.1469-7610.2011.02495.x. PMC 3492851. PMID 22141434. ^ Nicolson RI, Fawcett AJ (January 2011). "Dyslexia, dysgraphia, procedural learning and the cerebellum". Cortex; A Journal Devoted to the Study of the Nervous System and Behavior. 47 (1): 117–27. doi:10.1016/j.cortex.2009.08.016. PMID 19818437. ^ a b Reynolds CR, Fletcher-Janzen E (2 January 2007). Encyclopedia of Special Education. John Wiley & Sons. p. 771. ISBN 978-0-471-67798-7. ^ "Attention Deficit Hyperactivity Disorder". NIH: National Institute of Mental Health. March 2016. Archived from the original on 23 July 2016. Retrieved 26 July 2016. ^ Comer R (2011). Psychology Around Us. RR Donnelley. p. 1. ISBN 978-0-471-38519-6. Archived from the original on 4 June 2016. ^ Germanò E, Gagliano A, Curatolo P (2010). "Comorbidity of ADHD and dyslexia". Developmental Neuropsychology. 35 (5): 475–93. doi:10.1080/87565641.2010.494748. PMID 20721770. ^ Fatemi S, Hossein S, Sartorius N, Clayton PJ (2008). The Medical Basis of Psychiatry (3 ed.). Springer Science & Business Media. p. 308. ISBN 978-1-59745-252-6. Archived from the original on 9 January 2017. ^ Capellinim SA (2007). Neuropsycholinguistic Perspectives on Dyslexia and Other Learning Disabilities. Nova Publishers. p. 94. ISBN 978-1-60021-537-7. Archived from the original on 9 January 2017. ^ Moore DR (July 2011). "The diagnosis and management of auditory processing disorder". Language, Speech, and Hearing Services in Schools. 42 (3): 303–8. doi:10.1044/0161-1461(2011/10-0032). PMID 21757566. ^ a b Pammer K (2014). "Brain mechanisms and reading remediation: more questions than answers". Scientifica. 2014: 802741. doi:10.1155/2014/802741. PMC 3913493. PMID 24527259. ^ Law JM, Vandermosten M, Ghesquiere P, Wouters J (2014). "The relationship of phonological ability, speech perception, and auditory perception in adults with dyslexia". Frontiers in Human Neuroscience. 8: 482. doi:10.3389/fnhum.2014.00482. PMC 4078926. PMID 25071512. ^ Pickering SJ (2012). "Chapter 2. Working Memory in Dyslexia". In Alloway, Tracy Packiam, Gathercole, Susan E. Working Memory and Neurodevelopmental Disorders. Psychology Press. ISBN 978-1-135-42134-2. ^ a b B erkhan O (1917). "Über die Wortblindheit, ein Stammeln im Sprechen und Schreiben, ein Fehl im Lesen" [About word blindness, adyslalia of speech and writing, a weakness in reading]. Neurologisches Centralblatt (in German). 36: 914–27. ^ Lyytinen H, Erskine J, Ahonen T, Aro M, Eklund K, Guttorm T, Hintikka S, Hamalainen J, Ketonen R, Laakso M, Leppanen PH, Lyytinen P, Poikkeus A, Puolakanaho A, Richardson U, Salmi P, Tolvanen A, Torppa M, Viholainen H (2008). "Early Identification and Prevention of Dyslexia: Results from a Prospective Follow-up Study of Children at Familial Risk for Dyslexia". The SAGE Handbook of Dyslexia. pp. 121–146. doi:10.4135/9780857020987.n7. ISBN 978-1-4129-4513-4. ^ a b Stein J (2014). "Dyslexia: the Role of Vision and Visual Attention". Current Developmental Disorders Reports. 1 (4): 267–280. doi:10.1007/s40474-014-0030-6. PMC 4203994. PMID 25346883. ^ Molfese V, Molfese D, Molnar A, Beswick J (2010). "Dyslexia and Dysgraphia, Developmental". In Whitaker HA. Concise Encyclopedia of Brain and Language. Elsevier. pp. 179–84. ISBN 978-0-08-096499-7. ^ Price CJ (August 2012). "A review and synthesis of the first 20 years of PET and fMRI studies of heard speech, spoken language and reading". NeuroImage. 62 (2): 816–47. doi:10.1016/j.neuroimage.2012.04.062. PMC 3398395. PMID 22584224. ^ Sharifi S, Nederveen AJ, Booij J, van Rootselaar AF (2014). "Neuroimaging essentials in essential tremor: a systematic review". NeuroImage. Clinical. 5: 217–31. doi:10.1016/j.nicl.2014.05.003. PMC 4110352. PMID 25068111. ^ a b Brandler WM, Paracchini S (February 2014). "The genetic relationship between handedness and neurodevelopmental disorders". Trends in Molecular Medicine. 20 (2): 83–90. doi:10.1016/j.molmed.2013.10.008. PMC 3969300. PMID 24275328. ^ Cain K (2010). Reading development and difficulties (1st ed.). TJ International. p. 134. ISBN 9781405151559. Retrieved 21 March 2015. ^ Levav I (2009). Psychiatric and Behavioral Disorders in Israel: From Epidemiology to Mental health. Green Publishing. p. 52. ISBN 9789652294685. Retrieved 21 March 2015. ^ Faust M (2012). The Handbook of the Neuropsychology of Language. John Wiley & Sons. pp. 941–43. ISBN 978-1-4443-3040-3. Archived from the original on 9 January 2017. ^ Benítez-Burraco A (2010). "[Neurobiology and neurogenetics of dyslexia]" [Neurobiology and neurogenetics of dyslexia]. Neurologia (in Spanish). 25 (9): 563–81. doi:10.1016/j.nrl.2009.12.010. PMID 21093706. ^ Kere J (September 2014). "The molecular genetics and neurobiology of developmental dyslexia as model of a complex phenotype". Biochemical and Biophysical Research Communications. 452 (2): 236–43. doi:10.1016/j.bbrc.2014.07.102. PMID 25078623. ^ Marshall CR (2012). Current Issues in Developmental Disorders. Psychology Press. pp. 53–56. ISBN 978-1-136-23067-7. ^ Rosen GD (2013). The Dyslexic Brain: New Pathways in Neuroscience Discovery. Psychology Press. p. 342. ISBN 978-1-134-81550-0. ^ Friend A, DeFries JC, Olson RK (November 2008). "Parental education moderates genetic influences on reading disability". Psychological Science. 19 (11): 1124–30. doi:10.1111/j.1467-9280.2008.02213.x. PMC 2605635. PMID 19076484. ^ Taylor J, Roehrig AD, Soden Hensler B, Connor CM, Schatschneider C (April 2010). "Teacher quality moderates the genetic effects on early reading". Science. 328 (5977): 512–4. Bibcode:2010Sci...328..512T. doi:10.1126/science.1186149. PMC 2905841. PMID 20413504. ^ a b Pennington BF, McGrath LM, Rosenberg J, Barnard H, Smith SD, Willcutt EG, Friend A, Defries JC, Olson RK (January 2009). "Gene X environment interactions in reading disability and attention-deficit/hyperactivity disorder". Developmental Psychology. 45 (1): 77–89. doi:10.1037/a0014549. PMC 2743891. PMID 19209992. ^ Roth TL, Roth ED, Sweatt JD (September 2010). "Epigenetic regulation of genes in learning and memory". Essays in Biochemistry. 48 (1): 263–74. doi:10.1042/bse0480263. PMID 20822498. ^ a b Pritchard SC, Coltheart M, Palethorpe S, Castles A (October 2012). "Nonword reading: comparing dual-route cascaded and connectionist dual-process models with human data". Journal of Experimental Psychology. Human Perception and Performance. 38 (5): 1268–88. doi:10.1037/a0026703. PMID 22309087. ^ Eysenck M, Keane MT (2013). Cognitive Psychology 6e. Psychology Press. p. 373. ISBN 978-1-134-44046-7. Archived from the original on 9 January 2017. ^ a b Eysenck M, Keane MT (2013). Cognitive Psychology 6e. Psychology Press. p. 450. ISBN 978-1-134-44046-7. Archived from the original on 9 January 2017. ^ Hulme C, Joshi RM, Snowling MJ (2012). Reading and Spelling: Development and Disorders. Routledge. p. 151. ISBN 978-1-136-49807-7. Archived from the original on 9 January 2017. ^ Sprenger-Charolles L, Siegel LS, Jiménez JE, Ziegler JC (2011). "Prevalence and Reliability of Phonological, Surface, and Mixed Profiles in Dyslexia: A Review of Studies Conducted in Languages Varying in Orthographic Depth" (PDF). Scientific Studies of Reading. 15 (6): 498–521. doi:10.1080/10888438.2010.524463. ^ Bishop DV (May 2015). "The interface between genetics and psychology: lessons from developmental dyslexia". Proceedings. Biological Sciences. 282 (1806): 20143139. doi:10.1098/rspb.2014.3139. PMC 4426619. PMID 25854887. ^ Schumacher J, Hoffmann P, Schmäl C, Schulte-Körne G, Nöthen MM (May 2007). "Genetics of dyslexia: the evolving landscape". Journal of Medical Genetics. 44 (5): 289–97. doi:10.1136/jmg.2006.046516. PMC 2597981. PMID 17307837. ^ "Tests for Dyslexia and Learning Disabilities". University of Michigan. Archived from the original on 13 March 2015. Retrieved 15 March 2015. ^ Peer L, Reid G (2013). Introduction to Dyslexia. Taylor & Francis. pp. 35–40. ISBN 978-1-135-37290-3. ^ a b "Screening and assessment". British Dyslexia Association. Archived from the original on 30 March 2015. Retrieved 11 March 2015. ^ Fletcher JM (July 2009). "Dyslexia: The evolution of a scientific concept". Journal of the International Neuropsychological Society. 15 (4): 501–8. doi:10.1017/S1355617709090900. PMC 3079378. PMID 19573267. ^ Verga L, Kotz SA (September 2013). "How relevant is social interaction in second language learning?". Frontiers in Human Neuroscience. 7: 550. doi:10.3389/fnhum.2013.00550. PMC 3759854. PMID 24027521. ^ Wilson SM, Rising K, Stib MT, Rapcsak SZ, Beeson PM (April 2013). "Dysfunctional visual word form processing in progressive alexia". Brain. 136 (Pt 4): 1260–73. doi:10.1093/brain/awt034. PMC 3613714. PMID 23471694. ^ Johnson JK, Lorch M, Nicolas S, Graziano A (May 2013). "Jean-Martin Charcot's role in the 19th century study of music aphasia". Brain. 136 (Pt 5): 1662–70. doi:10.1093/brain/awt055. PMID 23576129. ^ Harley, Trevor (2014). The Psychology of Language: From Data to Theory (4th ed.). Psychology Press. p. 227. ISBN 9781317938439. Retrieved 14 February 2015. ^ Wandell BA, Rauschecker AM, Yeatman JD (2012). "Learning to see words". Annual Review of Psychology. 63: 31–53. doi:10.1146/annurev-psych-120710-100434. PMC 3228885. PMID 21801018. ^ Vandermosten M, Boets B, Poelmans H, Sunaert S, Wouters J, Ghesquière P (March 2012). "A tractography study in dyslexia: neuroanatomic correlates of orthographic, phonological and speech processing". Brain. 135 (Pt 3): 935–48. doi:10.1093/brain/awr363. PMID 22327793. ^ Ayers S, Baum A, McManus C, Newman S, Wallston K, Weinman J, West R (2007). Cambridge Handbook of Psychology, Health and Medicine. Cambridge University Press. p. 689. ISBN 978-1-139-46526-7. Archived from the original on 9 January 2017. ^ Heim S, Wehnelt A, Grande M, Huber W, Amunts K (May 2013). "Effects of lexicality and word frequency on brain activation in dyslexic readers". Brain and Language. 125 (2): 194–202. doi:10.1016/j.bandl.2011.12.005. PMID 22230039. ^ Mather N, Wendling BJ (2011). Essentials of Dyslexia Assessment and Intervention. John Wiley & Sons. p. 272. ISBN 978-1-118-15266-9. ^ Beeson PM, Rising K, Kim ES, Rapcsak SZ (April 2010). "A treatment sequence for phonological alexia/agraphia". Journal of Speech, Language, and Hearing Research. 53 (2): 450–68. doi:10.1044/1092-4388(2009/08-0229). PMC 3522177. PMID 20360466. ^ Tonkonogy JM, Puente AE (2009). Localization of Clinical Syndromes in Neuropsychology and Neuroscience. Springer Publishing Company. p. 409. ISBN 978-0-8261-1968-1. Archived from the original on 29 April 2016. ^ Leff A, Starrfelt R (17 October 2013). Alexia: Diagnosis, Treatment and Theory. Springer Science & Business Media. ISBN 9781447155294. ^ Rapcsak SZ, Beeson PM, Henry ML, Leyden A, Kim E, Rising K, Andersen S, Cho H (May 2009). "Phonological dyslexia and dysgraphia: cognitive mechanisms and neural substrates". Cortex; A Journal Devoted to the Study of the Nervous System and Behavior. 45 (5): 575–91. doi:10.1016/j.cortex.2008.04.006. PMC 2689874. PMID 18625494. ^ a b Ellis AW, Young AW (22 August 2013). Human Cognitive Neuropsychology (Classic Edition). Psychology Press. ISBN 9781135078478. ^ Yanoff, Myron (30 January 2014). Ophthalmic Diagnosis & Treatment. JP Medical Ltd. ISBN 9789350259528. Archived from the original on 6 September 2015. ^ "Visual Field Defects. Free Medical Information | Patient". Patient. Archived from the original on 9 August 2015. Retrieved 23 August 2015. ^ Brown, Thomas E. (2009). ADHD Comorbidities: Handbook for ADHD Complications in Children and Adults. American Psychiatric Pub. p. 236. ISBN 978-1-58562-158-3. Archived from the original on 9 January 2017. ^ Starrfelt R, Olafsdóttir RR, Arendt IM (2013). "Rehabilitation of pure alexia: a review". Neuropsychological Rehabilitation. 23 (5): 755–79. doi:10.1080/09602011.2013.809661. PMC 3805423. PMID 23808895. ^ Hillis AE (2013). The Handbook of Adult Language Disorders. Psychology Press. p. 40. ISBN 978-1-134-94801-7. ^ Papathanasiou I, Coppens P, Potagas C (2012). Aphasia and Related Neurogenic Communication Disorders. Jones & Bartlett Publishers. p. 168. ISBN 978-1-4496-8435-8. ^ Boller F, Grafman J (2010). Handbook of Neuropsychology: Disorders of visual behavior. Gulf Professional Publishing. p. 31. ISBN 978-0-444-50369-5. ^ Schuett S (August 2009). "The rehabilitation of hemianopic dyslexia". Nature Reviews. Neurology. 5 (8): 427–37. doi:10.1038/nrneurol.2009.97. PMID 19581901. ^ Farah MJ, Ratcliff G (2013). The Neuropsychology of High-level Vision. Psychology Press. pp. 177–179. ISBN 978-1-135-80652-1. Archived from the original on 9 January 2017. ^ Comer, Ronald (2011). Psychology Around Us. RR Donnelley. p. 232. ISBN 978-0-471-38519-6. ^ Hupé JM (2012). "[Synesthesia as a neuronal palimpsest]" [Synesthesia as a neuronal palimpsest]. Medecine Sciences (in French). 28 (8–9): 765–71. doi:10.1051/medsci/2012288019. PMID 22920879. ^ a b Bogon J, Finke K, Stenneken P (2014). "TVA-based assessment of visual attentional functions in developmental dyslexia". Frontiers in Psychology. 5: 1172. doi:10.3389/fpsyg.2014.01172. PMC 4199262. PMID 25360129. ^ Brunswick N (10 April 2012). Supporting Dyslexic Adults in Higher Education and the Workplace. John Wiley & Sons. pp. 115–. ISBN 978-0-470-97479-7. Retrieved 10 April 2012. ^ a b Schulte-Körne G (October 2010). "The prevention, diagnosis, and treatment of dyslexia". Deutsches Arzteblatt International. 107 (41): 718–26, quiz 27. doi:10.3238/arztebl.2010.0718. PMC 2967798. PMID 21046003. ^ Lyytinen H, Erskine J, Aro M, Richardson U (2009). "Reading and reading disorders". In Hoff E. Blackwell Handbook of Language Development. Blackwell. pp. 454–474. ISBN 978-1-4051-9459-4. ^ van der Leij A (November 2013). "Dyslexia and early intervention: what did we learn from the Dutch Dyslexia Programme?". Dyslexia. 19 (4): 241–55. doi:10.1002/dys.1466. PMID 24133037. ^ Sawers P (30 June 2011). "Dyslexie: A typeface for dyslexics". Archived from the original on 13 April 2012. Retrieved 9 April 2012. ^ a b Marinus E, Mostard M, Segers E, Schubert TM, Madelaine A, Wheldall K (August 2016). "A Special Font for People with Dyslexia: Does it Work and, if so, why?". Dyslexia. 22 (3): 233–44. doi:10.1002/dys.1527. PMID 27194598. ^ Barquero LA, Davis N, Cutting LE (2014). "Neuroimaging of reading intervention: a systematic review and activation likelihood estimate meta-analysis". PLOS One. 9 (1): e83668. Bibcode:2014PLoSO...983668B. doi:10.1371/journal.pone.0083668. PMC 3888398. PMID 24427278. ^ Cogo-Moreira H, Andriolo RB, Yazigi L, Ploubidis GB, Brandão de Ávila CR, Mari JJ (August 2012). "Music education for improving reading skills in children and adolescents with dyslexia" (PDF). The Cochrane Database of Systematic Reviews (8): CD009133. doi:10.1002/14651858.cd009133.pub2. PMID 22895983. ^ O'Hare, Anne (2010). "Dyslexia: What do paediatricians need to know?". Paediatrics and Child Health. 20 (7): 338–343. doi:10.1016/j.paed.2010.04.004. ^ Hetzron, Robert (8 October 2013). The Semitic Languages. Routledge. ISBN 9781136115882. Archived from the original on 6 September 2015. ^ Tasman A, Kay J, Lieberman JA, First MB, Riba M (29 January 2015). Psychiatry, 2 Volume Set. John Wiley & Sons. ISBN 9781118845493. ^ Protopapas A (2013). "From temporal processing to developmental language disorders: mind the gap". Philosophical Transactions of the Royal Society of London. Series B, Biological Sciences. 369 (1634): 20130090. doi:10.1098/rstb.2013.0090. PMC 3866431. PMID 24324245. ^ Zhao J, Qian Y, Bi HY, Coltheart M (November 2014). "The visual magnocellular-dorsal dysfunction in Chinese children with developmental dyslexia impedes Chinese character recognition". Scientific Reports. 4: 7068. doi:10.1038/srep07068. PMC 4238300. PMID 25412386. ^ Marshall C (2012). Current Issues in Developmental Disorders. Psychology Press. p. 152. ISBN 978-1-84872-084-8. ^ Garralda E, Raynaud J (16 January 2012). Brain, Mind, and Developmental Psychopathology in Childhood. Jason Aronson. ISBN 9780765708663. ^ Navas AL, Ferraz É, Borges JP (2014). "Phonological processing deficits as a universal model for dyslexia: evidence from different orthographies". CoDAS. 26 (6): 509–19. doi:10.1590/2317-1782/20142014135. PMID 25590915. ^ Berlin, Rudolf (1884). "Über Dyslexie" [About dyslexia]. Archiv für Psychiatrie. 15: 276–278. ^ Annual of the Universal Medical Sciences and Analytical Index: A Yearly Report of the Progress of the General Sanitary Sciences Throughout the World. F. A. Davis Company. 1888. p. 39. Archived from the original on 9 January 2017. ^ Brooks, Patricia (2014). Encyclopedia of language development. SAGE. p. 30. ISBN 9781483346434. ^ Mishra SK (2014). "Medial efferent mechanisms in children with auditory processing disorders". Frontiers in Human Neuroscience. 8: 860. doi:10.3389/fnhum.2014.00860. PMC 4209830. PMID 25386132. ^ Everatt J, Reid G (2012). "Dyslexia: An overview of recent research". In Reid G. The Routledge Companion to Dyslexia. pp. 3–21. doi:10.4324/9780203549230-8 (inactive 2019-02-15). ISBN 978-1-136-61711-9. ^ Richlan F (2014). "Functional neuroanatomy of developmental dyslexia: the role of orthographic depth". Frontiers in Human Neuroscience. 8: 347. doi:10.3389/fnhum.2014.00347. PMC 4033006. PMID 24904383. ^ de Beer J, Engels J, Heerkens Y, van der Klink J (January 2014). "Factors influencing work participation of adults with developmental dyslexia: a systematic review". BMC Public Health. 14: 77. doi:10.1186/1471-2458-14-77. PMC 3913008. PMID 24460949. ^ Pino M, Mortari L (November 2014). "The inclusion of students with dyslexia in higher education: a systematic review using narrative synthesis". Dyslexia. 20 (4): 346–69. doi:10.1002/dys.1484. PMC 4253321. PMID 25293652. This page is based on the Wikipedia article Dyslexia; it is used under the Creative Commons Attribution-ShareAlike 3.0 Unported License (CC-BY-SA). You may redistribute it, verbatim or modified, providing that you comply with the terms of the CC-BY-SA.